Just picked up an Stormy Blue '07 and already want to modify it. Been around big blocks my whole life and have no idea where to begin. Who's good and who's not. Any suggestions would be much appreciated. Thanks. 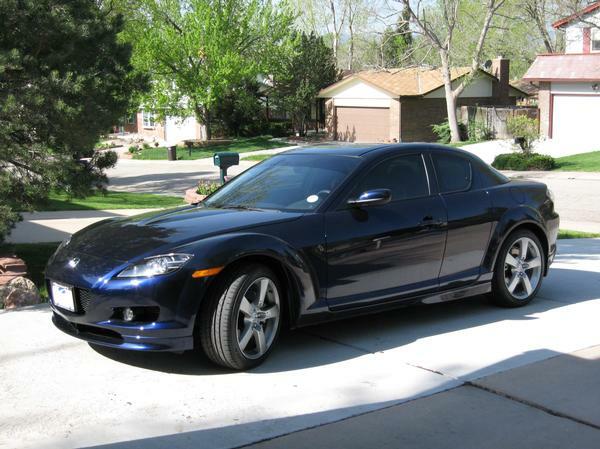 I just want to say "Welcome to the Club" and enjoy your new RX-8. I love the Stormy blue color. Post some pics. Hit the search button and start looking for answers to your question's. Personally I would wait to do anything to the engine. ( warranty) And all you have avialable is a turbo charger and some intake and exhaust items. And an ECU reflash form Racing Beat. Thanks! Had the car for 3 days and have been pulled over twice now. 1 speeding ticket and the other was for illegal tint. F*&% 'em if they can't take a joke! Really, that is all I want to do to the car. Keep it stock looking and modify the engine. Exhaust, intake, and possibly chipping it (if that sort of thing is available for these cars). I live in Alaska and visit Colorado about every 3 months for 2 weeks. This is my toy for when I visit. My buddy is a service writer at the dealer where I bought her at, so warranty can be fudged a little. No worries. Here is the pic. My son named her Sephera from the dragon off of the movie Eragon. Quite fitting actually. Fairbanks, eh? You just might win the award for furthest-north RX-8! How does it start at fifty-below? Or do you garage it for 7 months a year? I'm in Utah and the garage is only mandatory for December, January, & February. Not bad. They use a lot of salt on the roads here in winter and I don't want to expose the car to it anyway. How does it start at fifty-below? Or do you garage it for 7 months a year? I live in Alaska and visit Colorado about every 3 months for 2 weeks. This is my toy for when I visit. Welcome to the club. I love the Stormy Blues. A Turbo will give you the most power with this car. My buddy is a service writer at the dealer where I bought her at, so warranty can be fudged a little. No worries. I missed that part. Trying to read posts while visitors in my office want to talk to me! A turbo and an intake? Is that all that's out there? I have been researching tuners, but that is the closest thing to a chip. I think that is a little out of my league for dialing it in. As for the turbo and the intake. Any suggestions on what to get and what to stay away from? All the different brands rant and rave about how good they are, but who is lying? Um you need to do some more researching in regards to mods for your car. As there are plenty of things that you can add or change on the 8. I would recommend thaty you visit racingbeat's website. In regards to Turbos you need to do some research in this forum plenty of threads on this. Enjoy your mods. Greddy Turbo w/ Mazdaspeed Kit - Greetings from the UK!